from basics to more advanced, and the computer class handouts! Computer Basics Tutorials: A great series of web-based tutorials for gaining basic computer skills from the Queens Public Library. Get Started with Microsoft Office 2010 (and 2007): A Microsoft webpage with information and tutorials about all the new Office programs. Includes information on Word, Excel, PowerPoint, and Outlook. Check it out if you are used to the "old" version or are new to the programs. It works for Office 2010 and 2007! 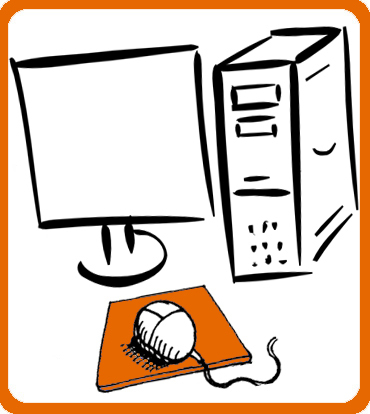 Mousing Around: An introduction to using the mouse. For people with no mouse skills or those wanting to learn more! Mousercise: A website that lets you "mouse around" and practice your mouse skills. Easy to use, with great directions! Handouts from the computer classes taught at the Burke County Public Library. These Handouts are in PDF format and require the free (and safe) Adobe PDF viewer. Click here to go to the Adobe Website to download it. Click on the name of the class to see the handout. Computer Basics (1 & 2): An introductory class, for beginners and those who want a refresher course! No previous experience required. Internet Basics: An introduction to the web, also known as the Internet. Basic mouse and keyboard skills suggested. Email Basics (1 & 2): An introduction to web-based email programs and skills; includes attachments and using your contact list. Basic Mouse and keyboard skills and basic web skills suggested. Word 101: An introduction to Microsoft Word Basics, including formatting and copying/cutting and pasting. Basic mouse and keyboard skills suggested. Word 102: This class will build on what we learned in Word 101. Learn how to do bulleted lists, insert pictures, and do other advanced tasks! PowerPoint 101: An introduction to Microsoft PowerPoint, the basics of making a slides with text and images, and exploring slide designs. PowerPoint 102: Learn how to customize templates, work with graphs, add transitions, and automatically time a slideshow! A basic knowledge of PowerPoint or attendance at PowerPoint 101 is required. Excel 101: An introduction to Microsoft Excel; learn how to create, edit, and format a basic spreadsheet, including basic equations and sorting. Excel 102: Learn how to work with advanced equations, add graphs, have a multi-sheet workbook, and set up conditional formatting. A basic knowledge of Excel or attendance at Excel 101 is required.